We discovered the Hand-Grasping Pie early in our stay one day while we walked to our apartment from West Lake here in Hangzhou. We ordered that first street food delicacy by pointing and nodding. 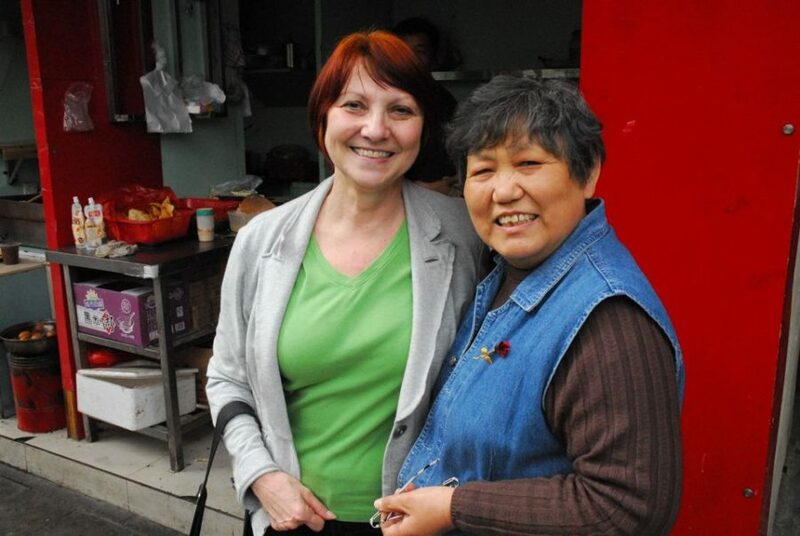 When Char, who teaches at Hangzhou Foreign Language School, told her students about the experience, they were thrilled that we would venture into the local culture in this way. One enterprising young girl, having learned that we didn’t know how to order the Hand-Grasping Pie because we could not speak or read Chinese, took photos and translated the menu for us and presented it to Char as a poster. The actual name of this street food does not easily translate, and this young student quite accidentally did us the great favor of providing it with the colorful, literal translation: Hand-Grasping Pie. The real name of this food depends on where the particular version of the pie, or pancake, has its origins. Each vendor might have a slightly different name for it, and might make it with slightly different ingredients in a slightly different manner. In the video that follows, Mr. Shan, who you will see make the pie, is from Shandong Province. 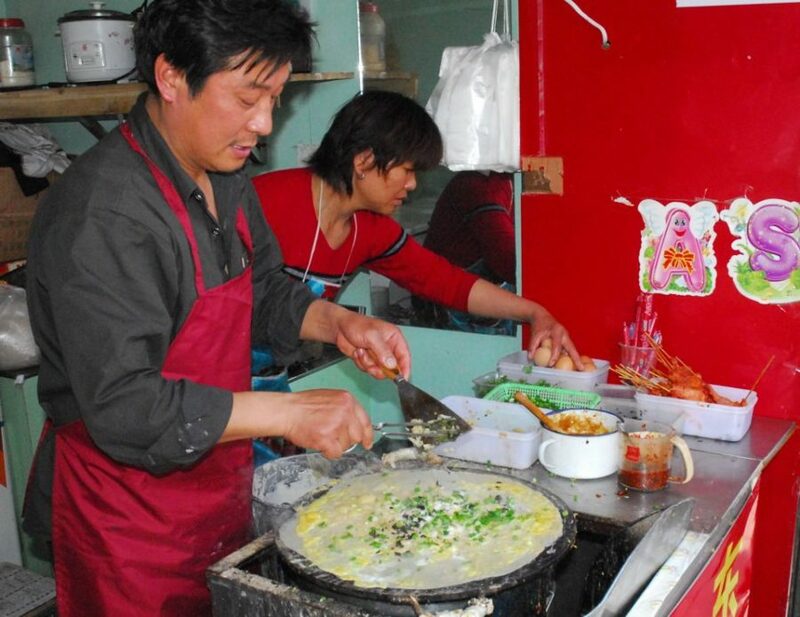 Thus, the name of this particular pie is, “Cereal Pancake in Shandong Style.” However, thanks to a thoughtful student, we now have a generic name for all such street food of this type. The Hand-Grasping Pie has become our favorite and is now Wednesday evening’s standard dinner fare. Each costs about 80 cents, and one is quite enough after a small appetizer of crackers and cheese and a glass of wine. One note about this episode is that, as we stopped with Nancy, our interpreter (who is introduced in the video), to read the menu, somewhat of a commotion ensued as passersby stopped to watch and listen about what we were doing. One woman began a conversation with Nancy and was telling her that she, the passerby, had a daughter who is learning English and has been to the United States three times–Ohio, in fact. “Oh, yes, we know it,” we said. “It’s not far from where we live.” The woman then began speaking directly to Char in Chinese with Nancy occasionally interjecting in English. The encounter engendered the incredible feeling that she was as much interested in learning about us as we were about her and her country. And all because just a few words could be passed between us. Mr. Shan would not let us pay for the Hand-Grasping Pies, and when we explained that we wished to do so, Nancy explained that it was a gift, and we were not to pay. We have learned that it is impolite to insist on paying when a Chinese person makes a gift to you. In response, I offered Mr. Shan and the two women in the booth a piece of Werthers hard candy, which they accepted cheerfully. Here, then, is the record of this most rewarding travel experience. I only wish that each of you could have been with us. Fascinating! And so great to see Char and to hear your voice, Joseph! Can you pack one of those griddles in your suitcase??? I just wish I could get the recipe for the batter. It’s sort of the difference between a pancake, as we know it, and a crepe. I think they would make great hors d’oeuvres.